POSH ESTATE SALES & PALMETTO ESTATE LIQUIDATORS was named #1 in MARKETING EXCELLENCE & MOST VIEWED ESTATE SALES LIQUIDATION COMPANY in South Carolina in 2014 by estatesales.com!!! Palmetto Estate Liquidators/POSH Estate Sales is the only estate sales and liquidation services firm in the Charleston and Low Country area having over 40 years of experience in interior and retail design, marketing, evaluating and selling antiques, collectibles, furniture, fine art, porcelain, glassware, fine and costume jewelry, Oriental carpets and other fine personal property. Our company does not know the words "we can't help you" and our company's motto is "Get it Done". No one and I repeat no one does it like we do or gets the results we get.Most everyone else in this area of South Carolina provide quality of just one step above "a garage sales" for their clients. This is not good enough for us or for the client. We are also not greedy because we know our marketing strategies outpace the others by quantum leaps so the client does not need to pay high flat rate fees that the others charge. I would recommend if you are going to need assistance with a living estate or estate sale, please check out our websites at http://www.palmetto-estate-liquidators.com/ and http://www.posh-estate-sales.com/​ and be sure to read the many unsolicited remarks and comments that our families and our buyers have made. This should solidify who in this industry and in this area does it best!!! The others' experience pales in comparison with Palmetto Estate Liquidators/POSH Estate Sales expertise in overall design esthete, retail, antiques and interior design knowledge, marketing and advertising know how and social media and internet savvy. Our comprehensive service is geared to meeting your time and profit expectations. Whether you are enduring the loss of a loved one, facing the turmoil of a divorce, the financial devastation of job loss and foreclosure or just wanting to downsize, we will assist you in getting back on your feet or just plain "moving on". First off, we are a Full Service Provider for the Resell Of used Personal Property. As a whole our team is better educated and all have had experience in customer service, retail sales principles, marketing strategies and advertising tactics. The Palmetto Estate Liquidators Service team is just "plain better" than the others and our approach to estate liquidations and sales is more sophisticated and based on "tried and true" principles that "work". Due to customer demand, Palmetto Estate Liquidators has created a luxury subsidiary, POSH Estate Sales, to meet the service demands of the high end and upscale market throughout the Charleston SC and Low Country area. The first and one of the most important differences is that we do not focus our marketing efforts just on the local market but have developed a very sophisticated GLOBAL marketing approach which has resulted in very high sales to major metropolitan areas throughout the US and abroad. Not everything our Family's have for sale is appreciated by the local consumer and thus we seek out the appropriate marketplace for the unique items. We have successfully sold items to customers in Hong Kong, New York, Los Angeles, Tokyo, Japan, London, England, Dallas, Dusseldorf, Germany, Chicago and etc. and these sales were never discounted but were often times sold for more than the Charleston Market would bear. We do not take from a family's sale prior to their sale date to fill in another unrelated sale scheduled for the following weekend... yes this is true and one of the others did just this as the Family informed us. This is the height of being unethical, arrogant and ignorant. We do not gather articles from different parties and conduct a sale and call it an "estate sale"... this is a consignment shop or flea market... call it what you will. We do not complain about what the family has left us with to sort through and organize... this is what we do and we are the BEST and we sure do not discuss the family or the circumstances in a public forum such as Face Book. What we do is plan the number of folks needed to get it done in the time necessary as our families are our priority and their sale is as important to us as they are. We do not get paid for antique appraisals and then sale the family's things in an estate sale, this is unethical and a conflict of interest. We do not have a minimum of what our customers have to spend to be able to write us a personal check...money is money. We do not sell real estate ...only personal property. The combination of the two may be seen as unethical and a "conflict of interest" in that having your hand in both "pots" will minimize your efforts in one or the other and from our experience that would be in the purveying of the personal property. We do not limit our buyers from bringing their purses or handbags into a sale, in that the finalization of the sale might be lost due to the buyer having to return to their car to retrieve their monies. We actually trust our buyers. Plus we provide our buyers with large shopping bags to make their shopping experience more enjoyable. We do not have one person only who can make minor pricing decisions, thus holding up the entire sale. We do not hover over our buyers while they are shopping. We do not have buyers make check payments to our families. We guarantee all checks and do not want our families in the tenuous position of getting a "bounced check". We do not have "theft monitors" but have folks who actually know what they are selling and can provide helpful information and multiple sales opportunities to the buyer. We do not do a sale every week (unless a situation arises where a family needs help) as this does not give the opportune time to sufficiently market and advertise the family's sale. We do not sale things prior to the sale, such as Direct Sales, unless authorized by the client, so that we do not disappoint buyers and minimize the demand for the family's supply of items to be sold. However, we do accept offers on items shown on the website and if the offer is bested the buyer can resubmit a higher offer. We do not sale everything out the first day of the sale as this is a sure indication "of giving things away" and not being sure of what is being sold or what it is worth. We do not have a retail outlet, a warehouse, or an online presence so we do not cherry-pick our familys' items at a lower price so that we can sell them in an on-site location. Based on buyer comments and reactions, Palmetto Estate Liquidators could never have imagined the amount of folks reading our "WE DO NOT" section of our website and we have decided that if you have a "WE DO NOT" you would like to share, we welcome your comments and statements. Our average net payouts to our families have been 150% - 200% higher than the family's expectation and our "buy ratio" is 78-80 out every 100 buyers. We have over 8300 buyer email addresses, including across the US and internationally. Because of our very sophisticated marketing approach, ten percent (10%) of total sales are shipped to buyers outside of South Carolina throughout the United States and abroad. Palmetto Estate Liquidators/POSH Estate Sales has over 12,000 "likes" on Facebook... Now that's recognition and results!!! 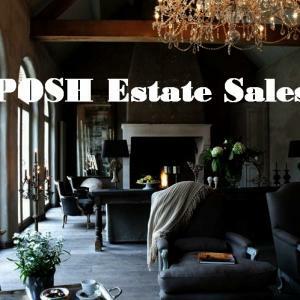 POSH ESTATE SALES LAST DAY 50% OR BETTER ALL MUST GO... HURRY IN WITH CASH, CHECKS, TRUCKS AND MUSCLES!!! THE OLD VILLAGE POST HOUSE INN IN MT. PLEASANT, SC GOING GOING GONE!!! POSH ESTATE SALES' LAST DAY SURPRISES & PRICES, EVERYTHING MUST GO MAKE PILES AND OFFERS LET'S SEE IF WE CAN DEAL!!! POSH ESTATE SALE LAST DAY BRING CASH, MUSCLES AND TRUCKS AND LETS GET IT GONE!!!! LIVING ESTATE SALE FEATURING MID-CENTURY, ANTIQUES, ART, ASIAN, TONS OF JEWELRY, GALLE', TIFFANY-TYPE, COLLECTIBLES & SO MUCH MORE LIVING ESTATE SALE IN THE HAMLETS, GOOSE CREEK, SC!!! MID-CENTURY DECORATIVES & COLLECTIBLES & SO MUCH MORE LIVING ESTATE SALE IN HANAHAN, SC!!! SOUTHERN COMFORT BEAUTIFUL 19th Century FURNITURE, ENGLISH ANTIQUES, ARTWORK, CLOCKS, DODGE & CALHOUN ESTATE FINDS & SO MUCH MORE LIVING ESTATE SALE IN MT. PLEASANT, SC!!! INCREDIBLE FABULOUS ESTATE SALE IN JOHN'S ISLAND *ORIGINAL ART* BRAND NAME FURNITURE* JOHN DEERE* TREASURES GALORE!!! CREATIVE COUPLE WITH REFINED TASTES LIVING ESTATE SALE *PEWTER* AREA RUGS*WICKER*GORGEOUS FURNITURE*GARAGE & GARDEN ITEMS & SO MUCH MORE!!! WORLD WAR II VETERAN ESTATE SALE FEATURING UNIQUE ANTIQUES, ARTWORK, LINCOLN MARK VIII AND SO MUCH MORE!!! PALM BEACH "GOLDEN GIRL" MEETS MOUNT PLEASANT LIVING ESTATE SALE IN SNEE FARM!!! OPULENT ESTATE SALE IN HISTORIC CHARLESTON* ANTIQUES* RICE BED*PAINTINGS*OBJET D' ART*LAMPS*WICKER & MORE!!! HISTORIC CHARLESTON LIVING ESTATE SALE FOR AN UP & COMING ACTOR & MUSICIAN!!! Candy, we cannot thank you and Pearl, Pat & Steph enough for making the last four days so filled with warmth, love and positive energy. We feel so good about the closure we have here mostly because of the way you helped us transition through this kind of dismantlement of our home in Charleston. I feel stronger because of the four of you. Thank you from the bottom of our hearts!!! A very big thank you, Candy! We are so happy with results and are pleased to have had the opportunity to work with you and your team. The services you provide helps many families and you all are so good at what you do!!! WOW,WOW,WOW and WOW!!!!!!!!!!!!!!!! I am flabbergasted! This is really great and I am very happy. You and your team are my guardian angels! you have really gone to bat for us in such a short time and we are sooooooo very appreciative. Thank you so much for everything. will talk with you soon. I have to tell you I am still speechless from just walking in the house this afternoon!!! After ya'll left, we walked around for a few more minutes just looking (admiring) at what was no longer there. We kept saying, "How did they do this?" I know I have used the words like amazing, wonderful, beautiful, overwhelming, fabulous over and over. I just can't think of many more words other that these to describe what you and your team did with all of our treasures and how we are feeling about the results of the sale! You certainly not only met, but tremendously exceeded our expectations! No one could have convinced me that so much would have been sold, let alone the amount of money that was collected! Genius, just geniuses, I must say! Your team of ladies that I met today, were all so pleasant and still smiling after many hard days. I so appreciate them saying they had such a good time. That makes me feel so right about this whole process. I really was serious in saying that I would love to work with ya'll sometime in the near future. I just love having fun with fun ladies!!! I know that the Murrells Inlet area is challenging as far as buyers. I’m glad that you were running the estate sale because you certainly possess expertise and bringing buyers to the table which enabled me to accomplish my goal of moving onto my next chapter in life. You and your associates did an outstanding job and I sincerely appreciate all of your efforts. I’m very happy with the results of the sale. We can’t help the demographics of Murrells Inlet, but despite that you deserve a HUGE applause! transition in my life. You all made it fun and easy! more, but it is my thank you to you all. Love, Mary"
beginning life changes seamless. Please give everyone big hugs and "thank you's"
to all who helped! Also, I hope you, too, are pleased. We will be forever grateful! your crew, remarking how friendly, professional and organized the event was.